Fall decoration ideas for all tastes! 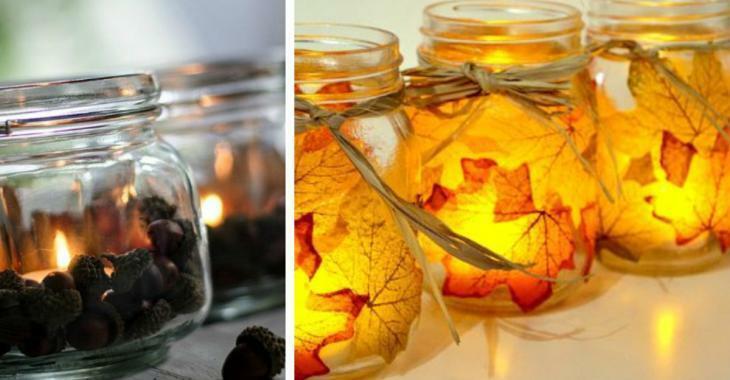 TMason jars, but really, any glass jars that can be recycled from the kitchen, jam jars, pickle jars, or even relish jars, can be used to craft all these beautiful fall decorations. However, if you can recycle or get Mason jars from a department store, their particular shape and the 3D designs on the Mason jars really gives them that added charm for creating all kinds of fabulous decorations. 1) White acrylic spray paint, jute, some white lace, and artificial flowers to turn these jars into an autumn centerpieces, but, take a close look and you'll see that it could be just as beautiful as a summer centerpiece simply by changing the flowers inside. 2) Corn leaves and raw rope will beautifully decorate an autumn vase for your fresh flowers. 3) Artificial leaves and Mod Podge style varnish glue to decorate glass jars for fall. 4) White acrylic spray paint and raffia! 5) Tealight candles in small glasses placed in the center of the jars and add acorns between the jars and these glasses. 6) Same principle as with the acorns. Candles placed in glasses, at the bottom of jars. 7) White acrylic spray paint and stenciled letters made with gold paint. 8) White, yellow and orange acrylic paint with an arrangement of artificial flowers. 9) Stencils of fall styles or patterns, white acrylic paint, jute and colored ribbons. 10) White is also very beautiful in autumn! 11) As is black for Halloween night! 12) The jar painted in beige, you can craft a pretty scarecrow for Halloween night. 13) A simple piece of jute with orange flowers and some greenery for autumn. 14) Orange acrylic spray paint, jute and glued wooden letters. 15) By sticking artificial leaves on jars, you can simply spray paint on the jars and use the leaves as stencils. The jars then become tealights for candles. 16) Mod Podge varnish glue and silk tissue paper! 18) By sticking a small handful of wood and rolled pipe cleaners and a leaf on the green painted lid of the Mason jar, painted in orange, you can easily craft a cute little pumpkin. 19) By drawing autumn leaf patterns with 3D paint, you can paint the rest of the jar using a brush and metallic gold paint. 20) The same can be done with 3D gold paint and ivory white paint to write autumn notes. Like, be grateful for the Thanksgiving season/holiday. Do you like all these beautiful fall decor ideas? Share them!